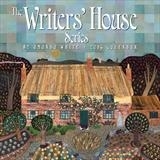 American publisher Andrews McMeel has produced this beautiful glossy wall calendar featuring 13 of my Writers' Houses. In glorious full colour with a commentary on each house. In shops worldwide and also online via Amazon and The Book Depository.